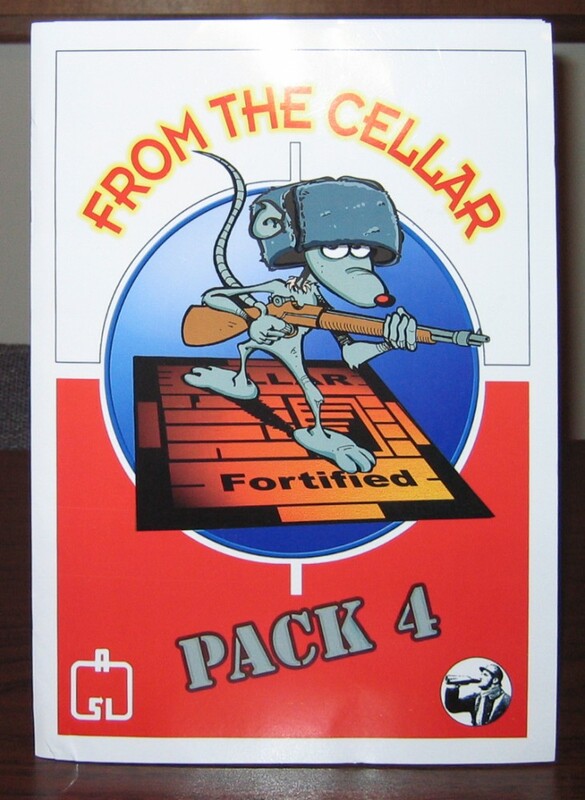 From the Cellar Pack 4 (Ftc4) is French third party publisher Le Franc-Tireur’s latest scenario pack. For LFT, 2009 has certainly been an esoteric year, seeing the company release two ASL products very different from the standard offerings that the hobby is used to seeing. One was St. Nazaire: Operation Chariot, the historical module simulating the 1942 commando raid; the other is this product. When the “From the Cellar” series started, it consisted merely of “leftover” scenarios that did not make it into issues of the magazine for one reason or another; as a result, the subject matter consisted of whatever the subject or recent issues of LFT had been. From the Cellar Pack 3 branched out from this, as it was essentially a themed scenario pack designed by an outside American designer. 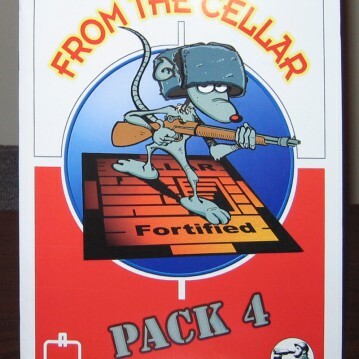 Ftc4 follows in this vein; it, too, is a themed scenario pack designed by an American ASLer, Robert Hammond. What is unusual and innovative in this pack is the subject matter: the Russian Civil War. Or, rather, one part of it. Its unofficial title, chosen by Hammond but not actually appearing on the packaging, is “Rising Star, Falling Cross: The Russian Civil War in Manchuria, Siberia, and Outer Mongolia.” Well, that’s a mouthful. The scenarios are set in the period 1918-1921, with the exception of 2 that pre-date the Russian Civil War but apparently were tosssed in regardless. There have been one or two Russian Civil War scenarios published in the past, but this is the first in-depth examination of the subject in ASL. As such, the first question that comes to mind is whether or not ASL is even a suitable game system for this subject. ASL was designed to simulate World War II era squad level combat. The tactics of World War II were a direct result of the experiences of World War I. During that earlier conflict, the combatants tried a variety of techniques to overcome the “stalemate of the trenches.” Some were brute force, such as massive employment of artillery. Some techniques involved technological innovation, such as the development of tanks. And many of the techniques involved tactical innovations of various sorts, infantry and artillery alike. Some of these innovations turned out to be tactical dead ends, but for the larger, more sophisticated armies (German, British, French, American), some of the tactical methods evolved to become modern (20th century) small unit tactics. The question is, then, can ASL be used to simulate armies from an era before those more sophisticated tactics had evolved? Could it do it at all? Could it do it only with special SSRs? How can a squad-level game deal with combatants where the squad was not even a true unit of tactical maneuver? For the Germans, British, French and Americans, combat in the late 1910s and early 1920s probably could be handled with ASL rules, though it might be a bit of a stretch. For other countries, it took more time for those tactical innovations to be implemented, especially in countries with less money for training, and a poorly educated non-commissioned officers corps. For Russia, the situation was worse, as the country became racked by rebellion and civil war just at the time western countries were developing the new tactics. In this chaotic situation, numbers and bravery were employed more often than sophisticated tactics. It is thus definitely a stretch to give either Bolsheviks or White Russians the ability to use squads (as opposed to, say, platoons) much in the way of tactical maneuver capabilities. For the two scenarios set in 1908 and 1911, there is no resemblance between the way those combatants actually fought and the way they would fight using ASL rules. For the other scenarios, even those involving Western troops, players must realize that the control and flexibility they have with their forces is something their historical counterparts did not possess to the same degree. Leaving the not-unimportant issue of historical tactical usage aside, the product does seem to be well-researched, with particular thought given to weapons usage. Happily, the designer decided to take a relatively minimalist approach in introducing the conflict, so there are only a few pages of rules that depict the conflict and its combatants. Players will not need to absorb or remember a whole host of rules. The one drawback is that there is a lot of “nationality-switching.” In other words, the White Russians use Axis Minor counters, but are treated as Russians. 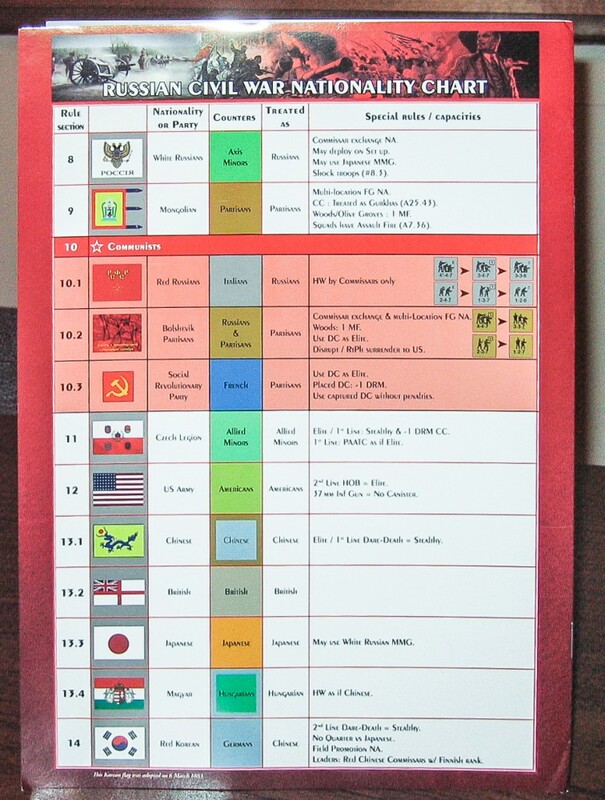 The Red Russians use Italian counters, while the Koreans use German counters (but are treated as Chinese). 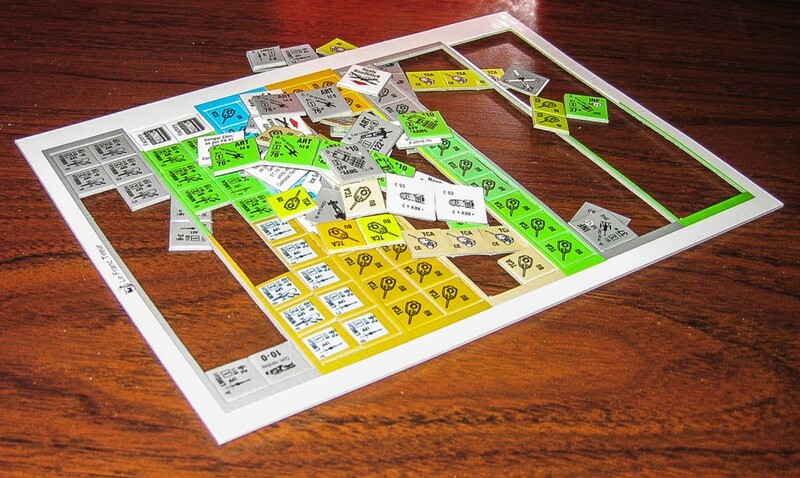 This sort of thing is done from time to time (see different designers’ attempts to simulate the Spanish Civil War) and is not exactly beloved by players, though it is understandable why it is done (so that entire new countersets do not have to be produced). Nevertheless, it can be a pain to deal with sometimes. Certainly, there is no shortage of combatants. Among the stars and guest stars of the pack are the White Russians, Mongolian partisans, Red Russians, Bolshevik Partisans, Social Revolutionary Party troops, the famous Czech Legion, the good old U.S. Army, the Chinese, the British, the Japanese, the Hungarians, and the Red Koreans (lots of crazy people named Kim, no doubt). All of this provides a great deal of color and chrome to the scenarios and provides the whole pack with a certain exotic air (an air increased still further with items like “Ice Sangars”). It is definitely different from playing the umpty-jillionth Germans vs. Soviets scenario. The physical quality of the product is high. The counters are extremely well-done, though the die-cutting was a it too deep (see comments in FtC3 for more details). 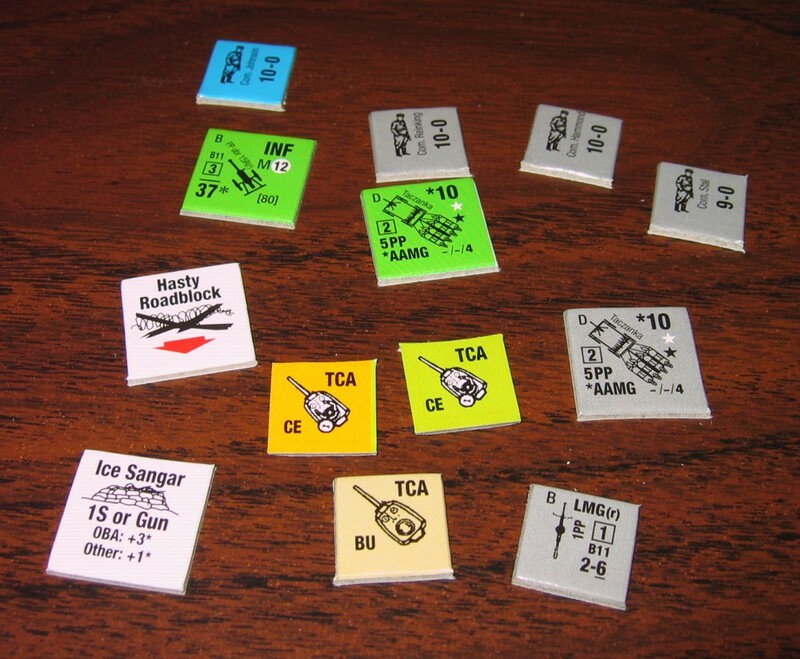 Some of the counters are directly related to the pack itself, providing SW and other counters used in the scenarios, while others are just additions to the ASL system itself, such as nationality-specific Crew Exposed counters. The scenario cards are extremely attractive, printed in color on glossy cardstock (copying official artwork); they are, however, European-sized rather than standard American letter-size, as most scenarios are. The scenarios are heavily weighted in favor of large scenarios. There are 6 small or medium-sized scenarios in the pack; the remaining 14 are large. However, many of these scenarios may play a bit faster than scenarios of their size typically do, because of the general lack of AFVs to slow the scenarios down. Two scenarios use Night rules, while one scenario utilizes OBA. Not surprisingly, there is no Air Support; also not surprisingly, Cavalry is fairly common. In general, the scenarios are SSR heavy, though most (though not all) are straightforward. The two non-Civil War scenarios both feature Manchurian troops battling against Mongolian militia. 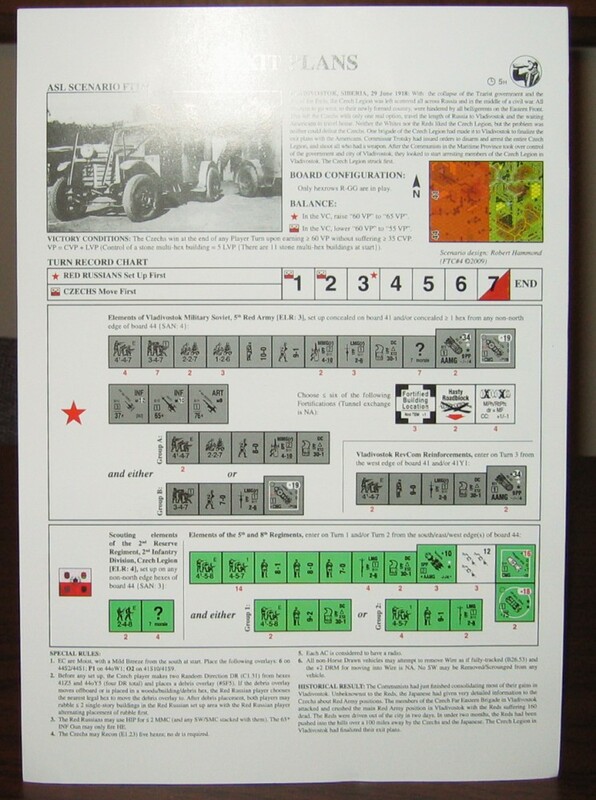 Of the Civil War scenarios, the Red Army appears in 12 actions and Bolshevik partisans in 7. White Russians appear in 7 scenarios, and Mongolian partisans in 2. Of the “interlopers,” the Czech Legion appears in 2, the British in 1, the Hungarians in 1, the U.S. in 4, and the Japanese in 2. 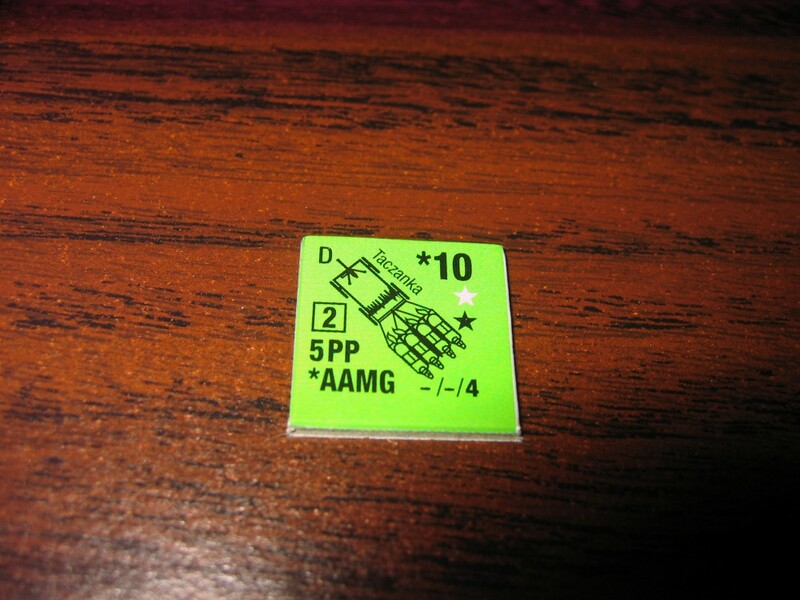 The U.S. forces are represented by 5-4-6 and 5-3-6 squads, which seems a tad unfair, as these were regular army units like the 31st Regiment (a unit that in “normal” ASL is represented by elite 6-6-7 squads). One of the scenarios, FT126 (Kabuki Theater), uses the La Gleize map from Kampfgruppe Peiper. Another scenario, FT127 (In the Mouth of Madness), uses map BFP-A (and relevant rules) from the Into the Rubble pack from Bounding Fire Productions. One scenario, FT130 (Mongolian BBQ), uses map HOB-I from Heat of Battle’s High Ground!, while another scenario, FT132 (Visions of Grandeur) uses map HOB-II from the same product. The last scenario in the pack, FT134 (Freebooter Relish), breaks some new ASL cartographic ground by using board 7, but declaring that the river hexes constitute a valley. It’s a bit surprising this hasn’t been used more often. One common theme that runs through the pack is the use of partially choose-able Orders of Battle, which is a feature that has proven popular among ASL players. This feature appears in 15 of the 20 scenarios. Typically, such a scenario includes a standard OB for a side, and then provides additional forces (which could include squads, leaders, or other items) that are chosen by the player from among 2-3 possibilities. For example, in scenario FT118 (Exit Plans), the Czech Legion player is given a fixed OB of 15 squads and assorted other unit, but is also provided with his choice of one of two force augmentations: Group 1 (2 x 4-5-8 squads, 9-2 leader, DC) or Group 2 (4 x 4-5-7 squads, 9-1 leader, LMG). In some cases, the choices are not even “units,” but can include things like battle hardening, fanatic status, stealthy status, or more. These options give players more choices, add spice to battle situations that might otherwise be a tad vanilla, provide for increased replayability, and in general heighten the play value of the scenarios. One scenario in particular is worth noting, FT127 (In the Mouth of Madness), which is a 3-player scenario featuring Bolshevik Partisans, the Social Revolutionary Party, and the Red Army in an internecine clash for control of the city of Glaskov in Siberia in April 1920. 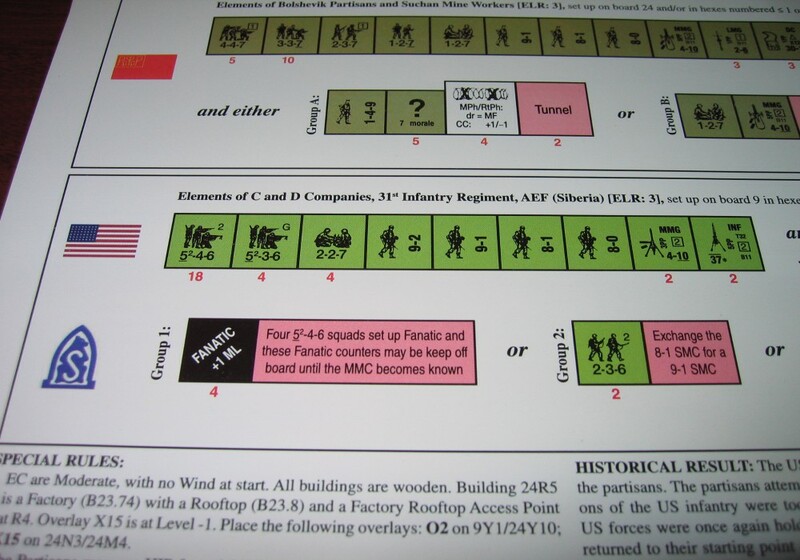 This is the first published 3-player scenario since the scenario Dogs of War in Kinetic Energy’s Time on Target #3 back in 1996 (2009 is a banner year for 3-player scenarios, as another will be released at ASLOK 2009 by Schwerpunkt in their Rally Point #4 pack). It is a beefier scenario than Dogs of War and will take longer to play. This is the scenario mentioned above that uses the Into the Rubble map, so unfortunately ownership of that product is required to play this scenario. Perhaps because the subject matter is so exotic, FtC4’s scenarios have not received much play. This is a bit of a shame. Though there are perhaps too many large scenarios in this product, nevertheless many of them look quite interesting and fun to play. Though the subject matter is esoteric and may not appeal to everybody, From the Cellar 4 is actually a pretty intriguing product.